In order to obtain a suitable sound environment, the anechoic lining is installed in a proper noise isolating structure. This enclosure may be one of several types of construction built on an isolated floor, or floated on springs or other vibration isolation material. Since Anechoic Wedges are not designed to support heavy loads, a working floor must be provided over the top of the floor wedge points. Eckel Industries recommends two types for general use: spring tension cable floors and grating floors (expanded and subway grating). Spring tensioned cable floors are best from an acoustical standpoint, whereas floor gratings are desirable where concentrated loads must be supported. Floor gratings are provided in sections so they can be removed during testing. 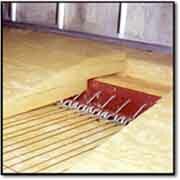 Spring tensioned cable floors are best from an acoustical standpoint, whereas floor gratings are desirable where concentrated loads must be supported. Floor gratings are provided in sections so they can be removed during testing. 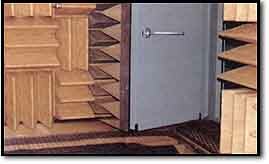 The Anechoic Chambers entrance sound attenuating doors can be fabricated in a variety of designs, including swing-in or swing-out hinged type, sliding-wall type, or track-riding type. Also offered is the space-saving interlocking wedge door. Here, anechoic wedges are mounted directly onto the door. When the door is swung open into the chamber, the wedge points interlock with those on the adjacent wall, minimizing the amount of lost space in the chamber. The ventilation system in Eckel anechoic chambers is designed to maintain a uniform temperature, provide fresh air for humans and/or animals and facilitate proper combustion in air-consuming equipment. Ten to twelve air changes per hour of the free field volume will generally maintain uniform temperature and provide ample fresh air for humans or animals, while removing normal heat from lights, body radiation, and instrumentation. 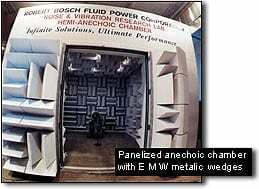 Eckel anechoic linings are constructed according to a strictly supervised installation protocol. Chamber linings are installed on roll formed wedge tracks attached to wall and ceiling surfaces by means of a “Z” bar mounting system. As wedges are erected, the space between the wedges is filled with light density compressible fiberglass or melamine foam. Eckel installs all hangers and brackets required to support instrumentation and test specimens. This includes a network of all necessary cables or wires. Eckel provides engineering or design data pertinent to the support of any type of equipment within an anechoic chamber upon request of the purchasers, their consultants or engineers. 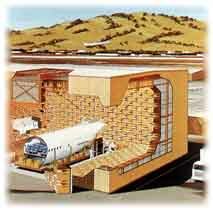 Electrical power, wiring, and other services are introduced into the anechoic chamber by pipe sleeves that pass through the basic structure and wedges. Eckel Industries designs pipe penetrations so that they enter the chamber through the valleys of the wedges and not the joints between the wedges. Electric services are always installed in compliance with local or UL-approved regulations. Electric light, conduits, and outlets usually penetrate the structure through the wedge valleys and terminate at that point with the appropriate outlet or fixture. Anechoic Chambers shall be isolated from structural vibration by one of the following systems.